Police officers on duty in the vicinity of a center believed to be used for re-education in Korla in western China's Xinjiang region, Nov. 2, 2017. The report, published by China's official Xinhua News Agency, said the ruling Communist Party's vision for the far western Xinjiang region is the assimilation of the indigenous Central Asian ethnic groups into Chinese culture and introducing them to a "modern" way of life. Governor Shohrat Zakir said in the report the extrajudicial internment of the Muslims was an effort to provide "free vocational training" in centers. He said they are paid a "basic income" during the training and that free food and accommodations are provided. The United Nations estimates about 1 million Uighurs, Kazakhs and other minorities have been arbitrarily detained in China. The U.N. said in August that the detentions were "deeply disturbing." The U.N. report preceded a U.S. congressional study released last week that concluded the protection of human rights in China has been on a "downward trajectory by virtually every measure" since President Xi assumed power in 2012. The bipartisan Congressional-Executive Commission on China accused Beijing of initiating an "unprecedented" campaign to repress ethnic minorities and said such abuses "may constitute crimes against humanity." 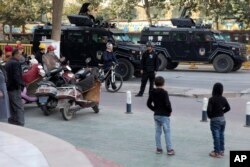 The commission report proposed legislation urging U.S. President Donald Trump to condemn "gross violations" of human rights in the Xinjiang region and for Trump to press Xi to immediately close the "political re-education camps."